Sometimes you just need a place to hole up a few days. 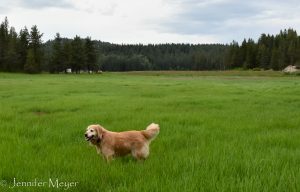 This was a convenient Thousand Trails park in Northwest Washington not far off the road to Leavenworth, where we would meet friends later in the week. It was certainly nice enough: remote and wooded, on a small lake with trails all around. It was practically deserted pre-season. The pool was closed and the lodge empty, but we did take a hot tub soak one night. We got our choice of spots overlooking a lush green meadow filled with prairie dogs. After Kate finished doing laundry (five loads! 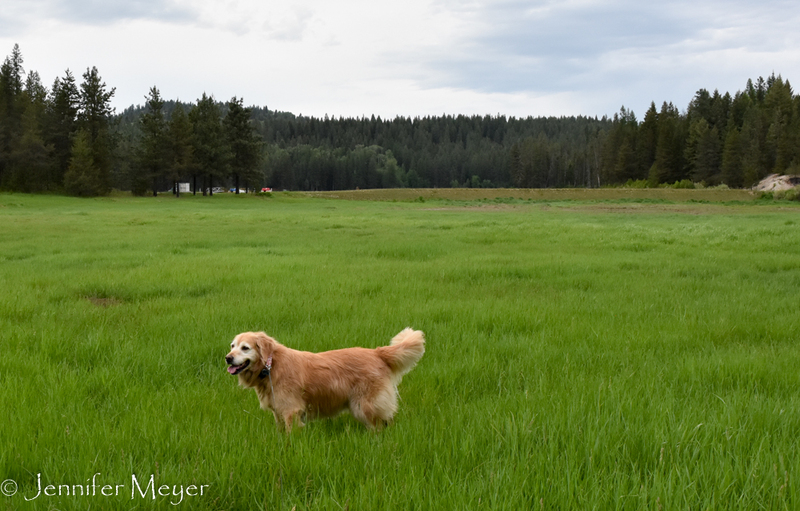 ), we took the fur kids for a hike over the field and around the lake. Well, we didn’t make it all the way around the lake, because on the far side, Kate spotted a moose drinking on the shore. Moose don’t have antlers this time of year, so it was hard to tell age or gender, but it seemed young enough that there might be a mama moose close by. 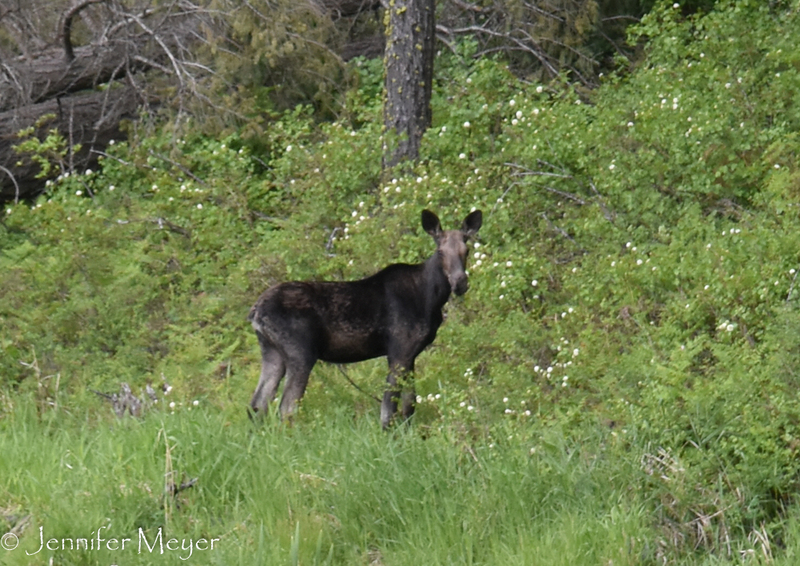 It was still pretty far away, but it seemed spooked by us and the trail went right in its direction, so we turned around at that point, just happy to have seen a moose again, this time really in the wild. After a happy roll in goose poo. Bailey needs a bath every few weeks, and we’re glad to have our outdoor shower for it, so she can have nice warm water. 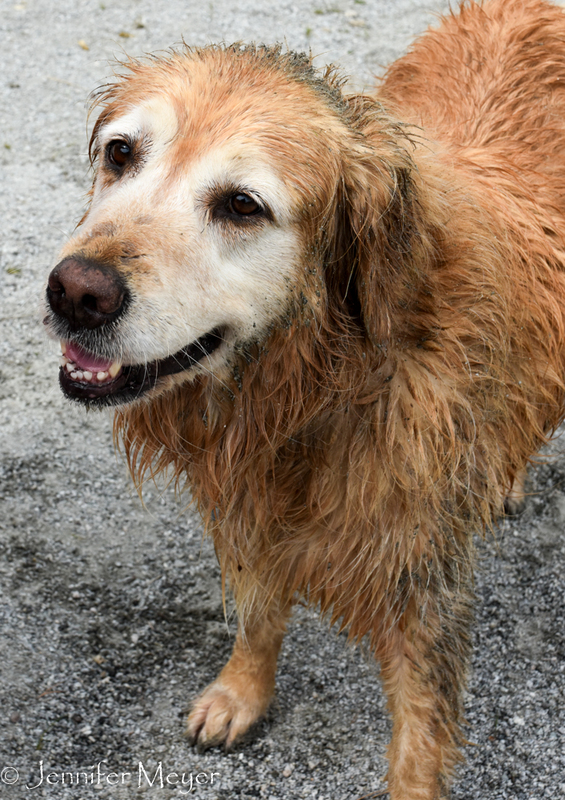 On our second day, we let Bailey swim to her hearts delight in the lake and, sure why not, roll in goose poo and gravel until she was gratifyingly grimy. Then I gave her a thorough bath and brushed her clean. Sometimes Gypsy tries to bathe Bailey, but she always runs out of spit before she finishes her head. She also tries to bury Bailey’s poo if we don’t bag it fast enough. I think she’s secretly appalled by Bailey’s standard of cleanliness. I belong to a Facebook group of LGBT RVers. I haven’t been very good about reaching out but sometimes people post where they are in case others are nearby. A woman had recently posted about dealing with gnats at Leavenworth RV Resort, and since we were going there, I asked how bad they were. On our second evening, two motor coaches rolled in near us that appeared to be two lesbian couples. The next morning one came over and said she recognized me from the LGBT RVers post. She was the one I’d asked about the bugs. The two couples were from Santa Fe, on their way to spend the summer in Alaska, and they invited us for a campfire that night. It rained, but we came anyway, and we all sat around a roaring fire under umbrellas, laughing and talking till late. We wished we had more days to get to know them better, but maybe we’ll catch them in Oregon on their way back in the fall. 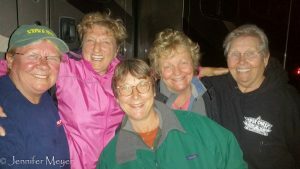 In all our 15 months on the road, other than at Sugarloaf and the Ohio Lesbian Festival, we’ve met only a handful of lesbians. There was a couple in Nova Scotia who offered refuge on their farm if Trump is elected. A couple in Texas who recommended places to go in Arkansas. A woman at a gas station in California who was headed out soon with her partner on an RV trek east. Brief conversations with couples in Maine and Minnesota, but really we have not met up with “people like us.” That made sitting around the drizzly campfire talking about Olivia cruises and sperm donors all the more gratifying. We’re often asked what it’s like as lesbians traveling all over the country, especially the South where our human rights can be legally denied. Do we encounter hostility? Have we ever felt threatened? Do we ever try to pass as sisters? Really, no. The only outward hostility we ever encountered was by a gay couple at the Grand Canyon (see Shunned by our Own). Go figure. If we were doing more boondocking on remote land, maybe we’d feel more vulnerable. But generally, we don’t hide (matching rings and a Marriage Equality bumper sticker) and we’ve never felt the need to. And generally, we’ve felt welcomed and accepted wherever we go. I appreciate getting to know people I wouldn’t ordinarily connect with. The new friends we’ve stayed connected with are those who are more or less in our camp politically, but we’ve had good interactions with people from all backgrounds and beliefs. People who I am quite sure vote Republican and go to church every Sunday might connect with Kate about quilting or talk with me about their pets. And by the time I casually refer to Kate as my wife, they’ve already decided we’re okay people and don’t blink an eye. Maybe the next time someone at church talks about The Gays, they’ll proffer up a memory of some nice women they met once. 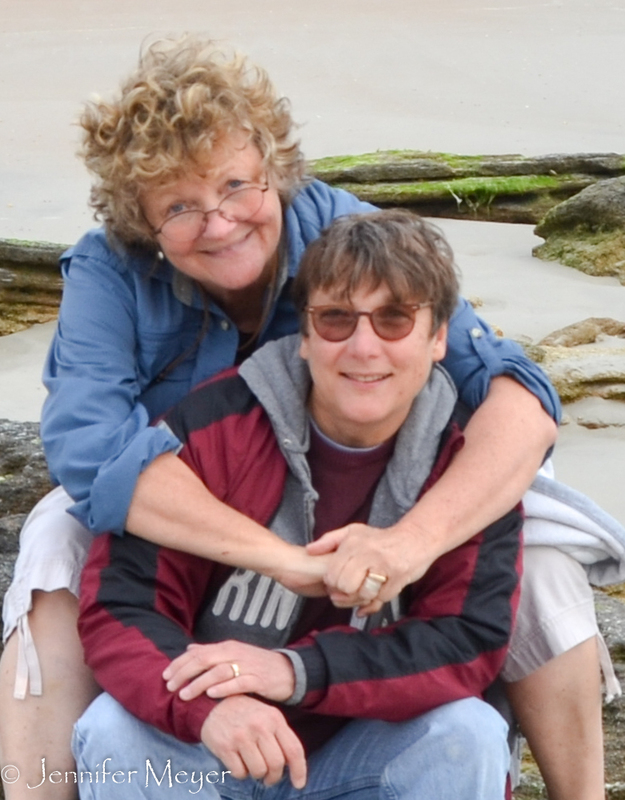 And sometimes they surprise us by sharing their own gay connections, like the loud woman from New Jersey who talked about her daughter marrying a woman in Israel. Because we are unassuming, middle-aged (okay, edging on senior) women without tattoos or flattops, we can blend more, and sometimes we take advantage of that. Maybe that’s why we’re accepted so easily. But I like to think the connections we make with Middle America help bridge the gap a bit – on both sides.